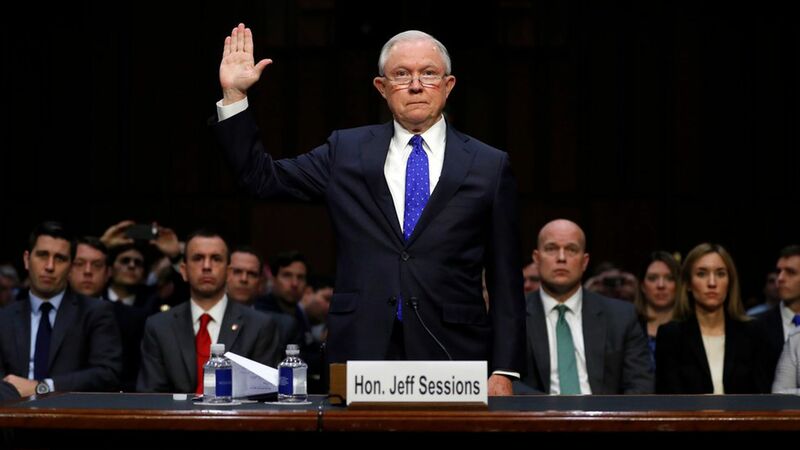 Attorney General Jeff Sessions explicitly denied that he'd been interviewed by Special Counsel Robert Mueller as part of the federal government's investigation into Russian interference during the 2016 election. During a heated exchange with Sen. Pat Leahy during a Justice Department oversight hearing before the Senate Judiciary Committee, Sessions hesitated and hinted that he'd have to clear his answer with Mueller before his denial. More on Sessions' interactions with Russians: Leahy also asked Sessions if he'd discussed a few different topics with any Russian officials since the start of the 2016 campaign: emails ("I don't recall"), Russian interference in the 2016 election ("No"), sanctions like the Magnitsky Act ("I don't believe I've ever had any discussion at any time about the Magnitsky Act"), and Trump's positions ("I think that's a possibility"). On discussing conversations with Trump: "I can neither exert executive privilege nor can I disclose the content of my private conversations with the president." On his refusal to assert executive privilege: "[T]he burden is on those who want to breach a core privilege of the president…to show precisely what it is that you'd like him to waive it on." On Comey's firing: "I don't think it's been fully understood the significance of the error that Mr. Comey made on the Clinton matter." On Mueller's probe: "He will produce the work in the way he thinks is correct — and history will judge." On whether the U.S. is doing enough to prevent future election interference: "Probably not." On the travel ban: "It's a lawful, necessary order that we are proud to defend." On DACA: Sessions said the legal basis to rescind the policy came via its blanket implementation when the Office of Legal Counsel had approved its use on an individual basis. He refused to discuss any discussions with Texas' attorney general regarding the state's suit against the policy, claiming privilege via work product. On supporting DREAM Act with border security: "I have not supported explicitly anything about citizenship but I am prepared to say…I think something could be worked out on this but it can't just be one-sided." On DOJ defending Trump in emoluments cases: "It is the responsibility of the Department of Justice to defend the office of the presidency in carrying out its duties against charges that are not deemed meritorious…We believe this is defensible." On the process behind the pardon of Joe Arpaio: "The president has the power to issue pardons with or without the DOJ involved…I'm just saying to you that I'm not personally at this moment prepared to give you an accurate answer."